When considering all the pastiches written involving Sherlock Holmes, it is rare to find one that is purely a sequel - most Sherlockian non-canon lore involves crossovers with other public domain characters, integration of science fiction and/or horror themes, or loose adaptations of the canon. Gary Lovisi's Sherlock Holmes: The Baron's Revenge, published by Airship 27 Productions, is a rare novel - a straightforward sequel to a past Holmes story that manages to be a crackling good read. The novel serves as a sequel to "The Adventure of the Illustrious Client" from 1927's The Casebook of Sherlock Holmes. Much like of Conan Doyle's later Holmes work, The Baron's Revenge shares a similar hard-boiled, almost pulp-flavored edge as it tells its tale. Thankfully, one does not have to read Conan Doyle's story in order to understand The Baron's Revenge, given various callbacks to the original tale. It's also a daring book in that it is written (except for one chapter) from Holmes' perspective. Although it would have been easy to fall into cliche and write Holmes as exceptionally omniscient, Lovisi does Holmes a great service by writing the detective at the proper emotional tone. It is easy to "hear" Holmes narrating the story. Rob Davis' illustrations throughout the book provide it with the right sense of pace and atmosphere, almost making it seem like a "lost" edition of The Strand Magazine. (Thankfully, it is a relatively quick read - I finished it within two days while commuting back and forth to downtown Chicago). 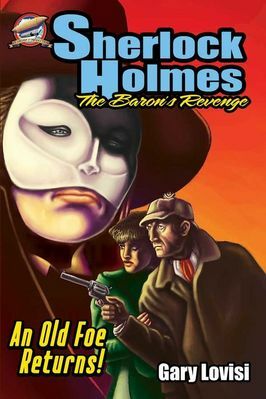 The Baron's Revenge is one of those rare Holmes books - an unexpected sequel that is a very good read and well worth checking out. It is available through Airship 27 as well as Amazon.com. This book is worth owning and reading. Repeatedly. Editor's note: Gordon regularly covers the intersection of Sherlock Holmes and the entertainment industry. You can also find him at Blog THIS, Pal! and Comic Related. In the early 1920s, former Army Lieutenant Walter Steale has returned to civilian life and settled down in Los Angeles amongst the glitz of the silent movie world. His one ambition is to put the horrors of World War One behind him and get on with a normal, peaceful life. Unfortunately his brother, Sam, the state’s Lieutenant Governor, coerces him into working as hired muscle for his crooked boss, Governor Davies. This leads Steale into brutal confrontations with crazy mob gangsters and a prostitution ring tied to several corrupt politicians. When a gang boss is murdered in a bombing and then Steale himself is targeted in another, even in his wounded condition he is savvy enough to realize he’s been set up as a patsy by his own brother. To clear his name and stay out of jail, Steale must rely on the courage of Virginia “Ginny” Joy, a beautiful young movie actress whose star is on the rise. As unlucky a couple as can be imagined, Ginny has fallen hard for the veteran doughboy and is willing to jeopardize her own career to save his neck. Author Stephen Jared is an accomplished film actor with a vast knowledge of early Hollywood history which he deftly employs here by creating a truly authentic background for his wonderfully crafted mystery. Refusing to mimic classical noir settings, Jared presents a truly straight forward and original narrative that moves at its own leisurely pace. Then when the reader least expects it, he delivers scenes of gut wrenching violence in such a cold, calculating style, this reviewer was reminded of the late Mickey Spillane’s work. 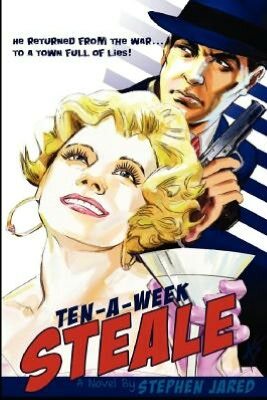 TEN-A-WEEK STEALE was a nice surprise in many ways, exceeding my own expectations and in the end delivers a better than average tale in a field overrun with cheap knock-offs. Wally Steale and Ginny Joy make a nice team, let’s hope we get to see them again real soon. CALL OF SHADOWS is a tough, dark, very film noirish story. The main character is David Ehlert, a world-weary soul who comes to the aid of newly widowed Ava Beaudine, who is caught in a deadly game being played by her late husband's business partner, the slimy Tony Jasco. But what sets this modern-day thriller tale apart from your usual tale of gangsters and murder is that Ehlert is a powerful wizard born in 1886 but who looks to be in his mid-to-late 30s. And so, what you might think is going to be the usual web of intrigue and murderous intent, suddenly turns into an even nastier, sinister plot involving dark sorcery and one sick, twisted magician. Ehlert is a haunted man, and the story behind the ghost who haunts him is a tale of true, heart-breaking tragedy. I can't talk too much about this novel without spoiling the surprises -- and boy, there are surprises on almost every page. 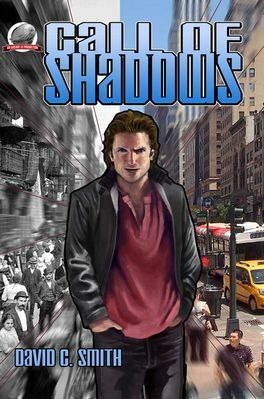 Just when you think you have it all figured out, when you're sure you know where the story is going, Dave Smith makes a sharp turn to the left and takes you on a detour through the shadowy streets of magic, mystery, and mayhem. The wizard Ehlert is the kind of anti-hero we don't see too much of nowadays: elegant, quietly confident, and all-too dangerous. He's not an over-the-top, flamboyant pretty boy tossing off one-liners and worn-out cliches with a smarminess that would make Hollywood proud. Oh, no. His sense of humor is subtle and dry, but this guy is also as dark as he is unassuming. This is urban fantasy for adults. This is what Harry Potter might have grown up to become if he lived in a more realistic world and had tragedy scarred his soul, instead of his forehead. Ehlert stands right up there, shoulder to shoulder, with Philip Marlowe, Sam Spade, and all the great characters right out of Black Mask, Weird Tales, and the Golden Age of Pulp Fiction. Ehlert is a man with a past veiled in shadow, and a future that is just this side of grim: he's a man caught in a present that doesn't quite seem suited to him. And the tragedy of his life, the one thing that keeps him going, that gives his life purpose, is the soul of this novel. But for me, the heart of this novel is the lovely, the endearing and unforgettable Ava Beaudine. Once you meet her, you'll never forget her. She'll steal your heart while Ehlert battles to keep evil forces from stealing her life, as well as her soul. This is a taut, excellent thriller, with crisp dialogue, solid characterizations, hard-hitting prose, explosive and violent action, and a plot that'll keep you guessing and turning the pages. I'm reading it for the fourth time. Give it a shot -- you may find yourself reading it more than twice! Tom Epperson is a stylist whose writing displays a truly unique sensibility rarely found in the field of modern thrillers before. He writes about complex people both good and bad, each locked into a personal moral code that propels them to accomplish wonderful feats of heroism or disgusting acts of depravity. When they collide through various unrelated chains of events the results are scenes of mesmerizing action. Gina and her son Luke are on the run from her husband’s mob family in New York. She had been living in the Witness Protection Program, after having testified and helped lock up her sadistic, cruel spouse. The problem is her father-in-law wants his grandson and ultimately bribes one of the Marshals assigned to protect them. By a miracle of quick thinking, she and Luke elude the assassin and flee westward ending up on the beaches of Southern California. Here they meet a quiet, likeable stranger named Gray who clearly has a secret past of his own. All the while the crooked Marshall, a trio of his redneck pals and a pair of deadly Russian hit-men are all converging on them like the hot Santa Anna winds. 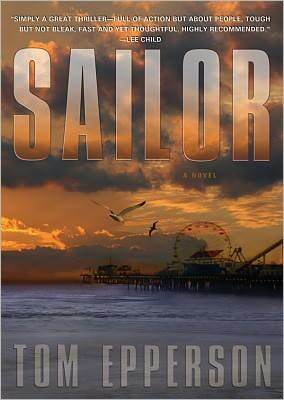 Imagine blending Elmore Leonard’s terse, economic prose with the fanciful poetry of a Ray Bradbury and you have “Sailor,” a truly beautifully crafted suspense thriller that plays across the reader’s imagination like the taut bow string of a mournful violin. None of this comes as a surprise as Epperson also wrote the screenplays to two of finest noir films ever produced; “One False Move” and “The Gift.” Like those two stories, “Sailor” is peopled by original, believable characters that inhabit a world both familiar and strange. The tension, the violence and the hope infused in these characters is perfectly etched and by the book’s finale becomes a poignant reading experience you won’t soon forget.